Moses goes up Mount Sinai again to receive instructions for 40 days and nights (Ex. 24:18). 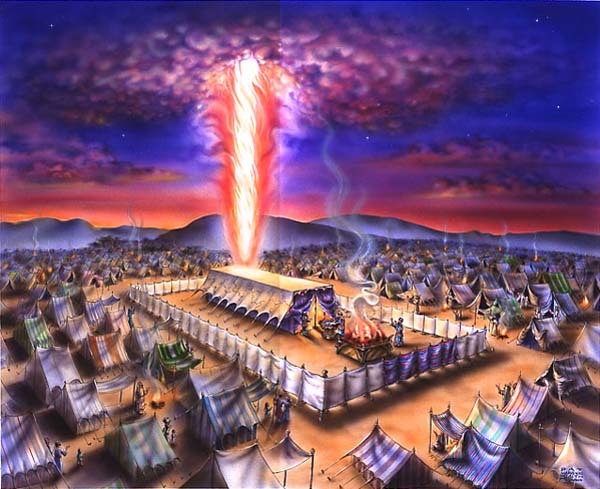 Matthew Brown – “As part of his ascension experience, Moses is said to have been washed, anointed, clothed in heavenly garments, called with names of honor, enthroned, and initiated into heavenly secrets”1. Joseph Smith noted that Moses received the “keys of the Kingdom,” and “certain signs and words”2. Next 7 chapters are instructions to Moses of how to build the Tabernacle while he is at Sinai. Meanwhile the children of Israel are at base camp without their prophet, and things start to go bad. 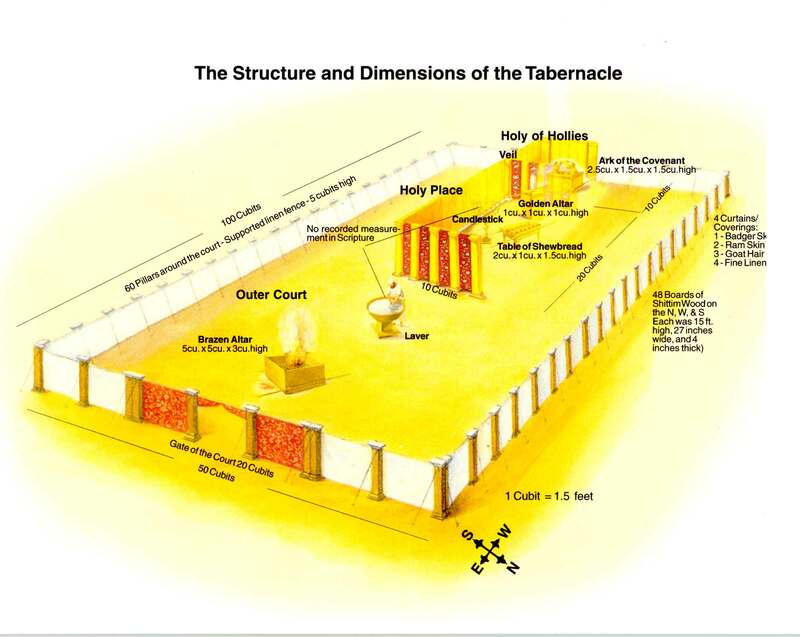 Preliminary considerations – The Tabernacle functioned under the Aaronic priesthood, and as such things are different than we would expect from a temple functioning under the Melchizedek priesthood. But much of the symbolism and typology remains the same. Also, because of the translation, editing, and copying of the Bible through many generations, particularly during Josiah’s reforms3, the Old Testament has some interpolations and insertions of Aaronic priesthood as the dominant authority throughout much of its history, even before the golden calf. Some things seem out of place, anachronistic, counterintuitive, or unlogical (see for example Ex. 33 verses 11 and 20). Some biblical scholars have noted that these are likely the result of later editing and rewriting. “mishkan” – the verbal root of which means “to dwell” = this was going to be a the dwelling place of the Lord among the people. All the people! Aaron’s garments consecrate him and allow him to minister as a priest. (Ex. 28:3). Consecrate being translated from the Hebrew words meaning to “fill the hand” – sacrificial emblems, olive oil, incense6. The “filled hand” is a widespread sign of offering sacrifice. Holman Bible Dictionary – “Priestly garment connected with seeking a word from God . . . In early OT history there are references to the ephod as a rather simple, linen garment, possibly a short skirt, apron, or loincloth. It is identified as a priestly garment… From its earliest forms and uses, it appears that the ephod was associated with the presence of God or those who had a special relationship with God… There are references to a special ephod associated with the high priest. It appears to have been an apron-like garment worn over the priest’s robe and under his breastplate… Woven of gold, blue, purple, and scarlet materials, it was very elaborate and ornate… The ephod was fastened around the waist by a beautiful and intricately woven girdle”7. Girdle = sash – Holman Bible Dictionary – “An ornate sash worn by the officiating priests… to gird up one’s loins means literally to tuck the loose ends of one’s outer garment into one’s belt. Loins were girded in preparation for running, battle, or for service for a master. The call to ‘gird your minds’ means to be spiritually alert and prepared”10. Golden crown (Ex. 28:36) = HOLINESS TO THE LORD. Taking upon him the name of the Lord, literally. These things were done before the priests entered the holy place. They were preparatory or initiatory ordinances to become ritually clean to serve in the Tabernacle. Other offerings of animal sacrifices were offered on the altar. All this was given to Moses while he was on Mount Sinai. The children of Israel, meanwhile, were beginning to build idols, “which shall go before us” (Ex. 32). Were desiring some intermediary to go before the Lord, now that Moses was gone, and they didn’t know if he was coming back (Ex. 32:1). 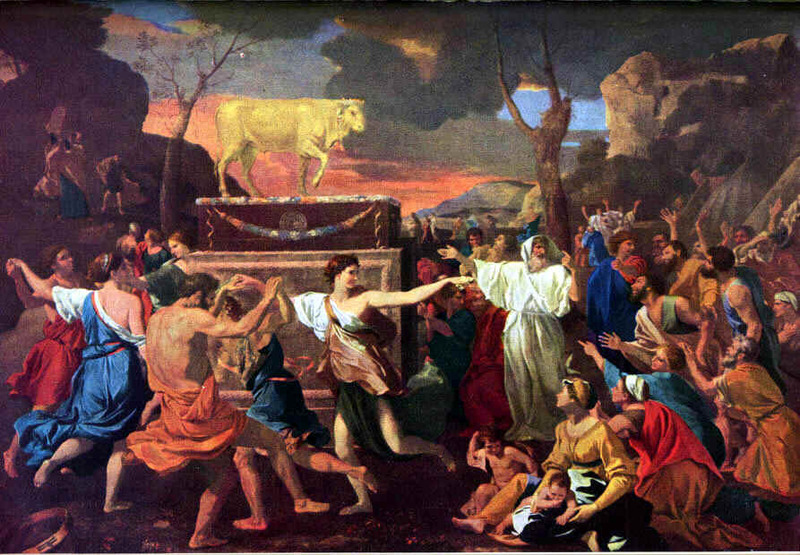 Golden Calf! Here is the turning point. Moses comes down and breaks the tablets in his anger (Ex. 32:19, symbolic of the covenant being broken, literally). The Lord chastises Israel for their great sin. They will no longer be able to become a kingdom of priests – “Ye are a stiffnecked people: if I came up into the midst of thee in a moment, I would consume thee: therefore now put off thy ornaments from thee, that I may know what to do unto thee” (JST Ex. 33:5; see also Ezek. 24:17, 23). The children of Israel can no longer come into the presence of the Lord because of their wickedness, and breaking their covenants. The Lord commanded the Israelites to remove their “ornaments” (Ex. 33:4–6). Matthew Brown suggests that this might have been connected with the “robes of . . . glory” that the Israelites were required to remove. “These robes may be related to the ‘garments . . . for glory’ (i.e. 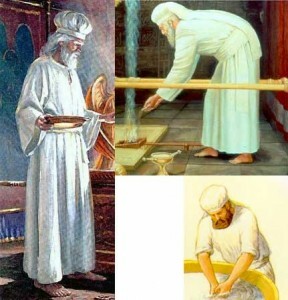 temple robes) worn by the Israelite priests”13. Here we see that all the people were preparing to wear the sacred robes, not just Aaron and his sons. But they were now unworthy of them. Moses, and later on Aaron, become the intermediary for the people (Ex. 33:7–11). They would go before the face of God, not the people. We get more insight into what happened here in the Doctrine and Covenants (D&C 84:17–27). Moses goes back up the mountain to get the stone tablets again, but this time the covenant did not include the “everlasting covenant of the holy priesthood” that the people were not prepared to receive anymore (JST Deut 10:2)15. For the rest of Israelite history until the coming of Jesus Christ, the temple performed its functions primarily through the Aaronic priesthood, the authority to perform outward and carnal ordinances, but not the authority to bring mankind into the presence of the Father. Christ restored what was lost through Israel’s iniquity, brought back the higher priesthood, reacquainted man with his Father, and restored the ordinances through which mankind may come once again into the presence of God. These ordinances have been restored again today. 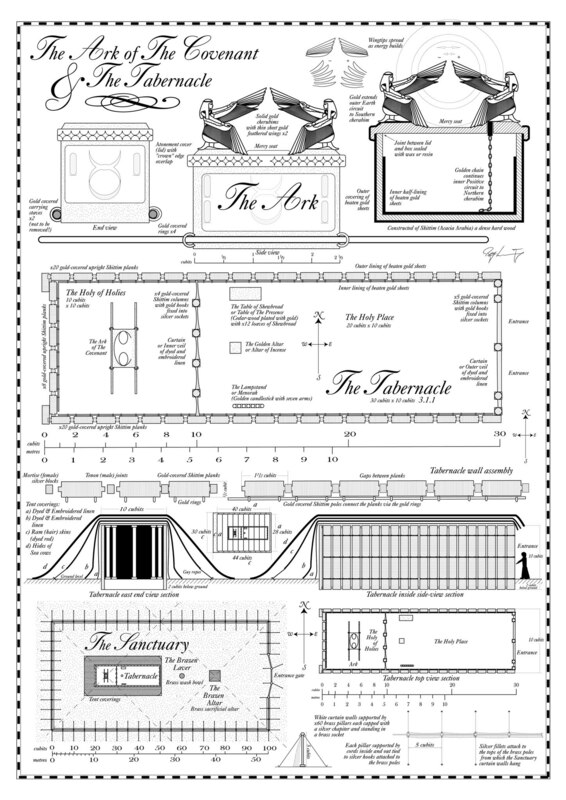 Here is another schematic drawing of the Tabernacle. 12. See Rashi’s comments on Yoma 21b, and the comments of the Vilna Gaon found in the Kol Eliyahu, on Aggadot Brachot 47b. 13. See the Comments of Rabbenu Bachya Sh’mot 25:10. Very good summary, Bryce! You were very thorough in your preparations for this! The one comment I would make is on the problem of the loss of the Melchizedek Priesthood with Moses. The D&C and JST passages you cite seem to conflict with other scriptures and LDS tradition that there were other prophetic figures (Elijah and others) who must have had the Melchizedek Priesthood, and also the Israelite kings (Psalm 110). In light of the latter, I interpret the passages concerning the removal of the Melchizedek Priesthood from the people of Israel to refer to a restriction of the higher priesthood to certain individuals–not a complete removal from the earth. I think Matthew Brown and others would agree with this. There is much external evidence that under the monarchy there continued to be performed rituals (especially those surrounding the New Year Festival) that appear to have been very similar to what we would see as Melchizedek Priesthood rituals and our temple endowment. I believe that these traditions persisted for centuries, but became corrupted over time and were largely eliminated by the reforms of King Hezekiah and King Josiah. Editors of the sacred texts, such as the “Deuteronomists” (time of King Josiah) and the “priestly” redactors (during or soon after the exile) were largely successful in removing these ancient Melchizedek ordinances from the religion and scriptures of the Jewish people. The post-exilic priesthood was likely exclusively Aaronic — the priesthood of the prophets and kings had been suppressed and virtually eliminated from public awareness, except from fringe groups (Qumran, Hebrews) who careful preserved more ancient traditions. You are absolutely right, David, that the D&C and JST passages seem to say that all Melchizedek Priesthood was taken away. But I agree with you that it was taken away from the people of Israel at large, but likely stayed in very limited fashion with the prophets and kings. That makes sense to me. Indeed, the high priest could still go into the Holy of Holies, but he was the only one. In fact, I was just reading in Matt Brown’s Gate of Heaven yesterday about how several General Authorities have stated that Aaron and his sons probably held the Melchizedek priesthood. I’ll have to find the reference and post it here. Thanks for that quote, Bryce! That is very helpful. I wonder, however, if Aaron and his sons held the Melchizedek Priesthood, which isn’t a problem for me, then when did Aaron’s line lose it? Was it when Moses and the higher law were taken away? Was there a decision made to exclude the priests from the higher priesthood and restrict it only to prophets and kings? Of course, the Bible gives us no insight into this transition. Bryce, this is excellent information. When comparing this to Lehi’s vision of the Tree of Life, it becomes so interesting. The symbols and parallels to that vision open it up just that much more. Bryce, excellent text, but I have a question. How come you get to teach this stuff, and I have to teach the high preists. from the Joseph Smith manual. I am not complaining, because my testimony of Joseph Smith has increased several orders of magnitude since I started teaching from that manual last year. I thought everyone was using it. I’ve had a couple people question me about this, so let me explain. 🙂 Yesterday was our Elders Quorum Presidency message. I was assigned by the quorum president to present the message on the subject of the Mosaic Tabernacle. One Sunday per month, usually the first, is reserved for a choice of subject of the Elders Quorum president. So that’s what it was. We teach from the Joseph Smith manual and the Teachings for Our Times the other Sundays of the month as prescribed. I’m glad to see someone make a post about this and get most of the correspondences correctly mentioned. You have done all students of the Temple a great favor with this post. Keep up the good work. There is far more depth beyond this, of course, and anyone following this guideline should be able to find at least some of it if they study the Temple Endowment in minute detail while bearing these things in mind. Thank you so much for this. We are so blessed to live in a day when the presence of God is found on the earth in his Holy Temples. We can endure his presence because of the ordinances of the Greater Priesthood. Not just the prophet, but anyone who will prepare himself can have this experience. It is not something that God is trying to hold back from us. He wants us to “come unto Him”, and then return into the world filled with his love. Aaron and his sons did not hold the _keys_ of the Melchizedek priesthood. The Keys were not carried down. They left with Moses. Aaron, nor his sons, were authorized to ordain others to the Melchizedek Priesthood. Aaron held the keys of the Aaronic Priesthood. For all intents and purposes, he was the Presiding Bishop. Thank you, commenter of my same name! Good explanation for Aaron’s relationship to the Melchizedek Priesthood — I think presiding bishop is a pretty good characterization of Aaron’s role. I am still not sure about the passing down of the keys of the Melchizedek Priesthood, though. Did Elijah not have the keys of the priesthood? How did Samuel anoint King David as king and Melchizedek priest if he did not have keys? Thank you for this great post. 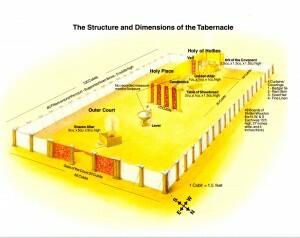 I love studying the Old Testament and the temple sybolism contained therein. I was wondering why you believe that Aaron was dressed any differently than his sons. Could it be possible that the different clothing (white linen) was worn by anyone officiating as the High Priest, who changed his clothes to the white linen only one time of year, when he officiated on The Day of Atonement (Lev. 16) and entered into the Holy Place. This change of clothing as one enters into a different “level” is still symbolic today. What do you think? Also, thank you for posting the quote by McConkie. I love the thought that Aaron held the Melchizedek priesthood, it makes so much more sense in all that was done in the tabernacle. Perhaps understand the “no man shall see the face of God and live” quote… we need to understand how the Children of Israel viewed death. They viewed it as one of Satan’s lies. Think about it… it really is a lie, because we do not die we move on to the next estate. This was a great testimonial that they believed in eternal exsistence. Now, when we understand that they did not believe death was real… the word to die might have held a different meaning to them. Those who previously saw the face of God did “die” as to this world… they were translated. Perhaps they were referring to the ability they had to stay in this estate once they were being personally tutored by God??? Those who saw the face of God simply progressed further still… and ultimately were “taken” to live with him in Zion…. The Children of Israel needed to stay here so that the covenant with Abraham could be fulfilled… sort of like Noah….Does that make sense? Great research and information.. thanks for sharing. I said they weren’t passed down through Aaron. I didn’t say they were never on the earth. Remember, Moses still held the keys, even though he was translated. And I’m sure there were other Translated being who may have been authorized to bestow priesthood as well. When there are no authorized Priesthood Key holders on the earth, authority has been known to have bestowed by heavenly messengers. This is what I believe happened. I have been following your blog/site for a few months now and have been impressed with the amount of accurate information you display. Thank you. I wondered if you could help me with a reference problem I’ve been having. I went to a lecture at BYU education week last fall and recall hearing about a “garment of light” which was worn by Adam and Eve before the Fall. This garment of light was taken away when they transgressed and therefore “they were found naked” and the need for a new garment to replace the one they lost was given to them – as a place holder and protection to them until they had proven themselves worthy to receive their garment of light in the next life according to the covenants they made. It is just as we make covenants in this life within the temple, those blessings promised to us cannot be fulfilled unless we prove ourselves worthy. In the next life, those blessings will be realized upon us. Have you heard of this and if you have, where can I find the reference to this doctrine? Thanks so much! If all else fails, I will wait until the next BYU education week and try to corner the lecturer to find the reference. Thank you for the kind compliment. 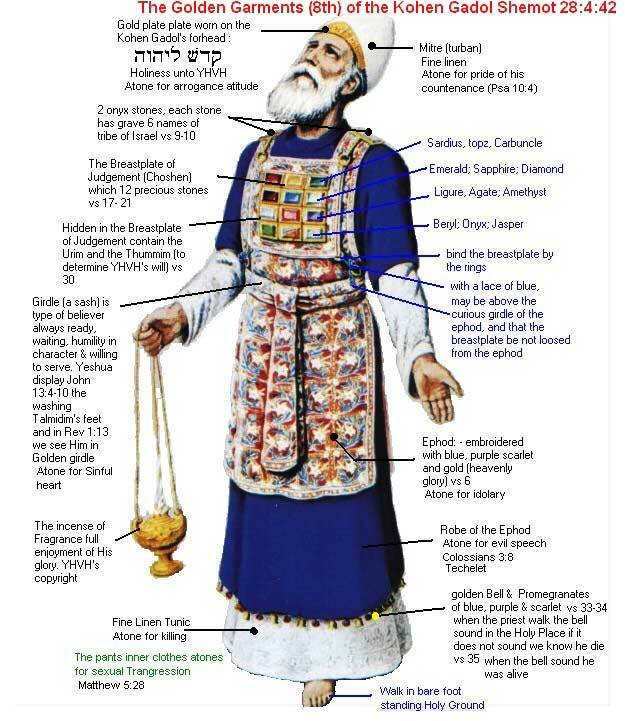 There are many traditions and sources which speak of the “garments of light.” For some of them you could try John Tvedtnes article “Priestly Clothing in Bible Times” in Temples of the Ancient World, or Donald W. Parry’s article “The Garment of Adam in Jewish, Muslim, and Christian Tradition” in the same book. There is also Nibley’s “Sacred Vestments” in Temple and Cosmos. They all speak extensively on this subject, and it is very fascinating. Oh! That is fantastic news!! Thank you! I stumbled across your site today, from what I have seen so far it is very nicely done. I share your passion on the temple and am also not a scholar but have read as much as I possible can on the subject. I was able to take Nibley, Parry and Steve Ricks though while at BYU. They were wonderful. I believe that Israels journey to the promised land represents man’s journey back to God (Temple Journey). Most my twist on Ancient Israel is going to be based on 1Cor 10.
b. Waters of red sea and cloud of fire as baptism and holy ghost, Lamb’s blood on the door posts as the blood of Christ. I believe that one of the points about the temple is that it also represents man’s journey back to God. We pass through the telestial kingdom and the terrestrial kingdom making covenants and receiving ordinances that will move us on to the next section of our lives. I’m a little less bold than to talk about as you say things like “the filled hand” in such a big audience but do like to discuss such things in smaller settings. I used to be bolder when I was younger. Thanks again for a very nice site. Just an additional idea on the mitre mentioned above. I have always preferred to think of it as the “round cap” and not the turban for one major reason. If we examine Exodus 29:6, it speaks of the crown placed upon the mitre. I can imagine a crown being placed upon a flat mitre, but not as much on a turban. It helps me fully appreciate even more the plan of salvation. Regardless of the specifics, though, what beautiful temple imagery to know that one day, through righteousness, we can expect a crown to be placed on our heads. This is just what we were looking for. I am looking for a picture of the original Tabernacle Menorah? Some authors have made a connection between the “asherah” that King Josiah removed from the temple during his reforms and the original menorah. The Hebrew word “asherah” is usually translated in our bible as “grove.” This “stylized tree” was supposed to have been in the Holy of Holies (not in the Great Hall of the temple, as the menorah was in later periods). The asherah is thought to have represented the Tree of Life, and was lit up by burning olive oil, symbolizing the idea that the Tree was fiery. Perhaps it looked much like the menorah of the Second Temple, but it may have looked even more like a tree. Representations that are available are of the menorah of the Second Temple, not that of Solomon’s Temple.